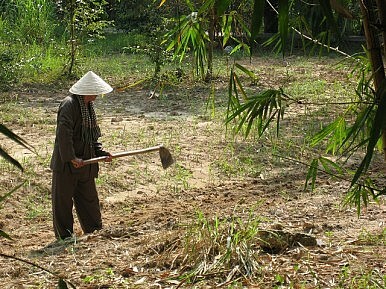 Land ownership has often been a tricky question in Vietnam. But Doan Van Vuon has defied the odds. Land disputes are crowded with environmentalists, farmers and greedy developers who work hand in glove with local politicians. Clashes have persistently tested Indonesia, Malaysia and the Philippines, and demand from the likes of palm oil plantations is as strong as the loggers’ ability to fell and clear. In Cambodia, land and ownership is a perennial sore point as the country continues to piece itself back together after 30 years of war that included two decades of absurd communist dictates. Slums occupying vast tracts of prime real estate in the capital are capturing the eye of Korean developers who want the country’s poor to move along with little or no compensation. Vietnam, where some in power still think communism and capitalism need not be an uncomfortable fit, has proven to be even more contentious. But one man, Doan Van Vuon, has defied the odds and emerged as a national hero after challenging his country’s bullying authorities. The 49-year-old rural fish farmer from Haiphong was leased 40 hectares of worthless swamp land in 1993, but through his own initiative and hard work turned it into a thriving aqua-culture business. He set a trend; other farmers followed his lead and turned a profit. Success surprised the people in power, a row erupted and officials sought to evict Vuon and in the process demolished his house. Vuon retaliated, armed himself with guns and explosive booby traps, and attacked the police and soldiers sent in to seize his property, injuring six. His actions made headlines across the country and earned him the type of public affection usually reserved for war heroes. In communist Vietnam, land is usually leased for 20 years, while the government retains control and legally can take it back at its discretion. However, farmers and their ilk have their own bond with the land and in Vietnam they would like to believe that they will be fairly compensated for any losses. Too many like Vuon have received nothing for their efforts, and discontent over corruption and greedy officials has simmered, threatening to erupt into outright public anger. Editorial writers, from the official and unofficial press, bloggers and senior government figures have come out in favor of Vuon. Then Vietnamese Prime Minister Nguyen Tan Dung added his clout and publicly rebuked the local authorities in Haiphong for their handling of the land dispute, saying they had made mistakes in the allocating, reclaiming and the use of force in attempting to get back the property. “As the decision to reclaim the land is not in line with the land laws, it isn’t legal,” Dung said. The prime minister has also launched an investigation into the demolition of Vuon’s home and urged the suspension of the officials involved. Vuon is likely to face legal action for his violent efforts, but Dung said the court should consider leniency in view of the way the authorities behaved. Legally, and morally, he should receive a suspended sentence. Perhaps more importantly is a nationwide review of land management and practices aimed at preventing this type of dispute from happening again. An honest review should make for enlightening reading – and provide for some scope for improved land management in Vietnam and beyond. Vietnam’s Experiment With E-GovernmentThe Beginning of a Political Doi Moi? Takeaways From the VCP’s Seventh PlenumSihanoukville: A Cambodian City Losing Its ‘Cambodian-ness’Is Vietnam Creeping Into a Succession Crisis?What Does Jokowi’s Win Mean for Indonesia’s Economy?